There are plenty of mesh Wifi systems out there. From Eero to Google Wi-Fi, everyone seems to be getting into the mesh network Wi-Fi game. I had been looking around at a variety of options out there when I happened to stumble upon the AmpliFi HD wi-fi system. It’s sleek design and the two advanced antennas made this something I had to try. So I reached out to AmpliFi to see if this product lives up to the hype and boy was I blown away. What is a Mesh Wi-Fi Network? 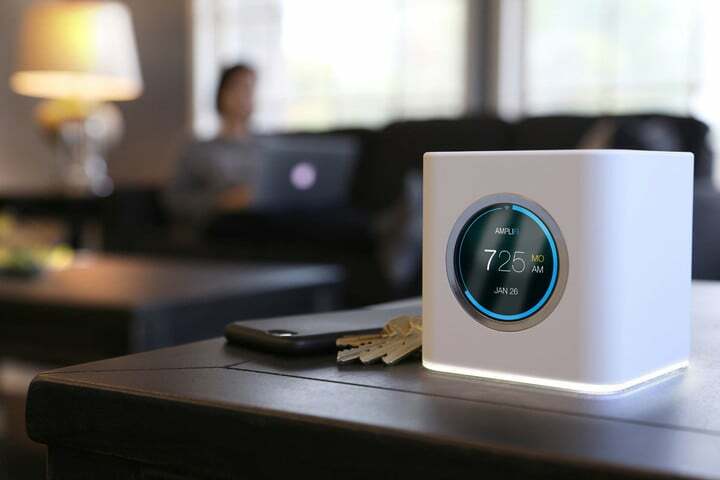 A mesh WiFi network is when two or more router-like devices work together in order to blanket your home of office in WiFi. It’s sort of like a WiFi system with multiple range extenders designed to work with virtually no effort. The difference, of course, is that instead of extending your network, what these systems actually do is create a whole new WiFi network, separate from your current router’s WiFi. They are also capable of communicating with each other in a way a typical range extender simply cannot. 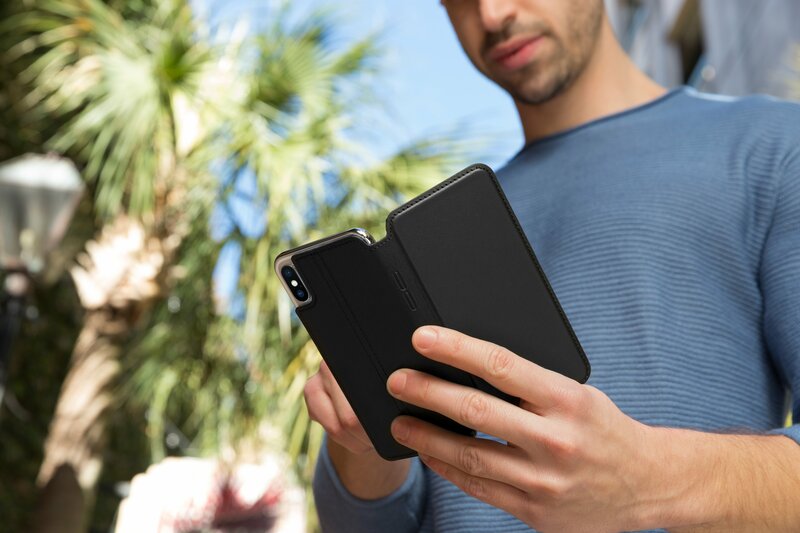 This means they are able to provide the best coverage possible to all your devices. 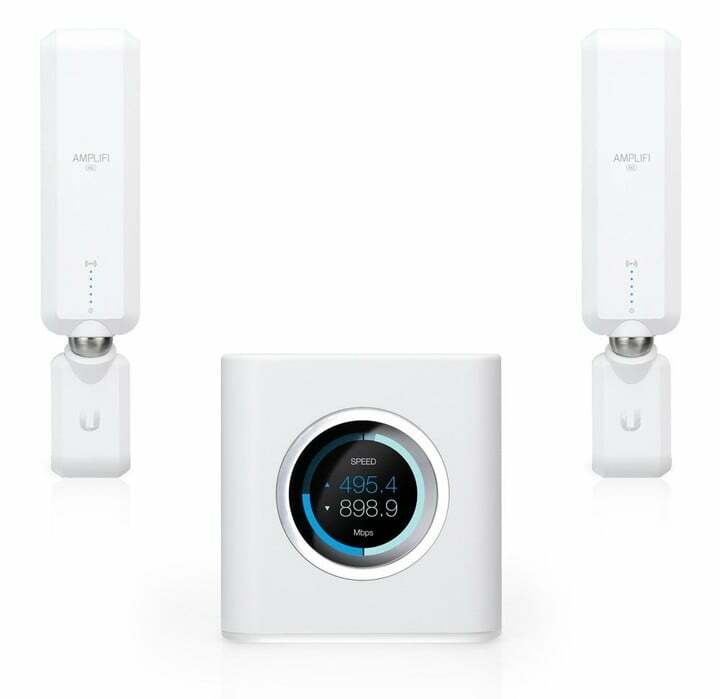 Setup for these types of mesh WiFi systems requires no more than a few minutes because most of the work is done through incredibly easy-to-use software. This is another huge bonus because playing with the admin settings on your typical router is basically a nightmare. With the AmpliFi HD, it literally took me less than 10 minutes from the moment my package was delivered to get my new system set up. As I stated above, setup couldn’t have been easier. What you get in the box is pretty straight forward. 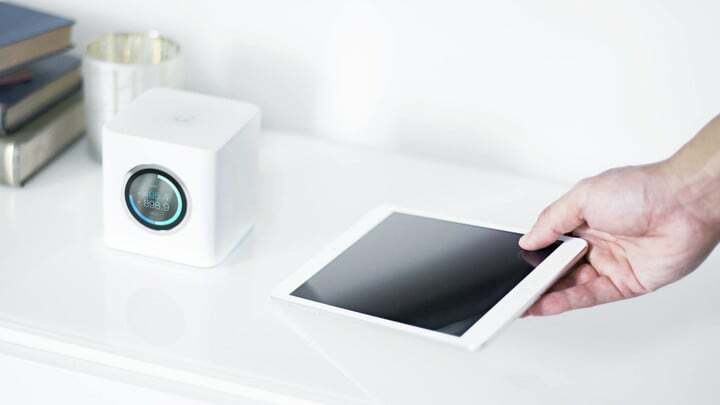 You get a main wireless unit, where your cable internet plugs into and you get two Wi-Fi mesh points that plug right into any three-prong wall socket. Once you power up the main unit and connect it to your cable modem, you are prompted to download the app. 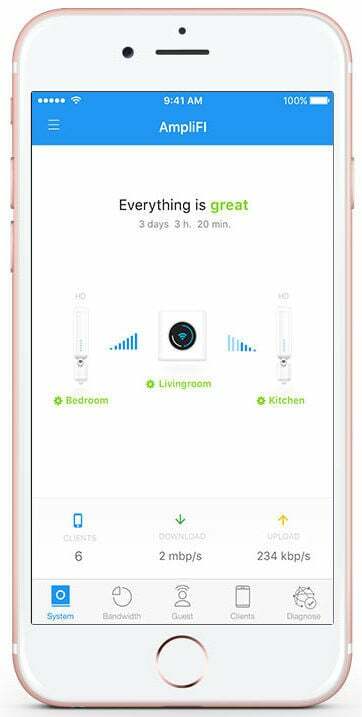 Once you open the app you’ll immediately see your AmpliFi HD Wi-Fi system and you’ll be prompted to name it. Once you do that, the app will go through some configurations and a few minutes later you’ll be all set up. From there, you have to decide where you want to put your two mesh points. This will obviously depend on how big your house is and where you’re getting the weakest signal. 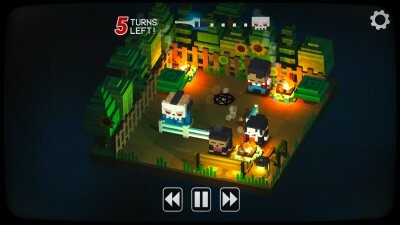 It takes a few minutes for the main router to acknowledge that the mesh routers have been connected, but once they are, the app will let you know. Let me just say this: After I installed this AmpliFi HD in my house, I immediately noticed a HUGE performance increase. To put things in perspective, I have a 100mb/s plan from Spectrum. I often get 100mb/s on my iMac, which I have directly connected to the router itself. But when it comes to the wireless signal on my iPhone, for example, even if I’m 50 feet away, I would more often than not experience speeds that were less than half of what I get on my iMac. Go a little further and I’d sometimes get speeds in the teens. Crazy, right? With the AmpliFi HD that’s no longer the case. It’s not as fast as the direct connection to my iMac, but I’m still getting 80-90mb/s speeds pretty much anywhere in my house. Like I said, it’s a huge difference. But speed tests alone weren’t enough for me. I wanted to know what difference this system made when it came to watching videos on YouTube and browsing the web and the good news is that it made a dramatic difference. Before, I would often have to wait a few seconds for videos to load up and skimming through them often wasn’t instantaneous. Now, both of those issues have been resolved. Everything loads super fast and I can skim and jump to other videos with absolutely no hiccups. It’s amazing. 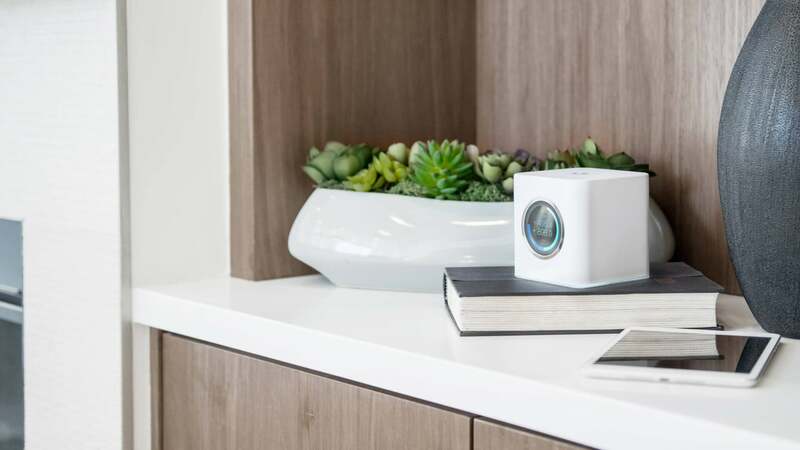 None of this stuff seems like a big deal before you get the AmpliFi HD, but once you have high-speed internet everywhere in your house, you quickly realize that there’s no way you can go back to a traditional router. Come to think of it, it’s kind of crazy that it’s 2017 and we’re still dealing with spotty internet issues in our homes. 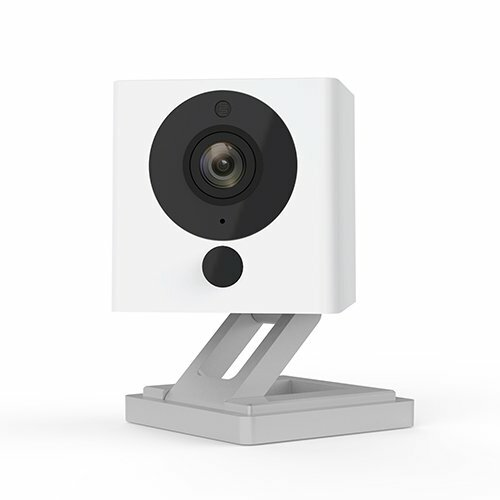 There are a ton of other cool features that come with this system including the ability to quite literally see every device that’s on your network and even pause wireless from being streamed to a particular device. You can also create profiles so that you can schedule internet access for specific devices which may come in pretty handy for anyone with kids. The main hub itself actually has a bunch of cool features as well including the small little round touch screen that displays different information as you tap on it. One screen shows the date and time, while other screens show you things such as speed of your network. It’s all pretty handy and truly turns your typical router into something you’re more than happy to display on your desk or shelf. I mean how many people can say their WiFi router looks good? I honestly can’t say enough good things about the AmpliFi HD mesh WiFi system. It’s easy to set up. It truly blankets your house in WiFi and it just makes using the internet in your home that much more joyful. As someone who depends on the internet for so much, including watching TV, this is without question one of the best products I’ve used in a long time.